The common purslane (Portulaca oleracea) or moss rose is an incredibly nutritious flower and leafy vegetable. Purslane boasts one of the highest Omega-3 content in the plant kingdom, making it an excellent substitute for those of you leading a vegetarian or vegan lifestyle. Omega-3 fatty acids are an essential nutrient for brain and nervous system health and exert a beneficial action on both the cardiovascular and digestive systems. Purslane contains generous amounts of vitamins A and C and thus contributes to maintaining beautiful skin, healthy mucous membranes as well as good eyesight and immunity. The vegetable is rich in essential minerals, particularly iron, magnesium, copper, potassium and manganese. Throwing a few stems with leaves into your salad not only adds texture and flavor to it, but also helps meet your daily demands of several essential nutrients. What is purslane? Purslane refers to a plant with juicy edible dark green stems and leaves and colorful flowers of great simplicity and beauty. The plant is native to the Indian subcontinent, but it can be found throughout the warm regions of the world. Common names for purslane include portulaca, pursley, hogweed or pigweed, moss rose, red root or verdolaga. More than 30 edible varieties of the Portulaca oleracea species exist and the species greatly enjoys the company of the tomato plant as it thrives in its presence. What does purslane look like? Purslane is a tiny plant with plump or fleshy dark green stems and leaves with pink or brown highlights that look tender and crunchy. It looks very much like an uninteresting moss rug, hence its classification as a weed. It bears beautifully yellow colored flowers with a simple petal design. What does purslane taste like? Purslane has a mild taste, juicy, meaty leaves and stems, somewhat similar in texture to mushrooms. Wild purslane is full of flavor, with a lemony or peppery taste. I find raw purslane goes great in a potato salad (I admit that the humble potato is one of my favorite veggies). It pairs well with rice, lamb and other veggies such as spinach and tomatoes, either in soups, stews or fresh salads. Because it contains a compound called oxalate, it is recommended to eat it cooked rather than raw. Oxalate is believed to lead to the formation of kidney stones if consumed in high amounts and is an anti-nutrient. People with kidney stones or kidney failure are advised to avoid eating foods rich in oxalate (spinach included), or cook them to reduce their content of the substance. Cooking purslane for several minutes can significantly reduce its oxalate content, but will also destroy some or most of its vitamin C.
1) Extremely low in calories. With only 16 kcal/100 g of raw stems and leaves, purslane is ideal for keeping your weight under control and even losing a few pounds. It is also 93% water so it will fill you up better than most foods. It makes a great salad vegetable and its meaty texture and green vegetable flavor allow it to be paired with a variety of other foods. 2) Rich in Omega-3 fatty acids. 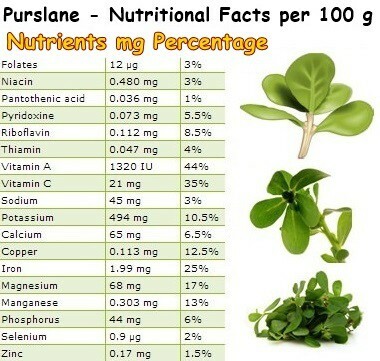 Purslane is one of the best plant sources of Omega-3. As you may already know, Omega-3 is one of the healthiest fatty acids. It has been shown to have a powerful antioxidant effect on our arteries, lower LDL (bad) cholesterol levels, prevent the oxidation of fats and significantly reduce coronary heart disease and stroke risks. Moreover, a generous Omega-3 intake has been linked to reduced joint pain and stiffness in rheumatoid arthritis sufferers and good cognitive development in newborns and young children. Omega-3 from fish sources such as cod, tuna or salmon is the healthiest form, but if you are leading a vegetarian or vegan lifestyle, then purslane, sunflower seeds, flax seeds, pumpkin seeds, walnuts and nuts and seeds in general are your best sources of the nutrient (see fish and seafood page). 3) Protects cardiovascular health. As a result of its generous Omega-3 content, purslane helps clear plaque buildup from artery walls, preventing restricted blood flow to the brain and heart. Moreover, it helps lower high LDL (bad) cholesterol and improve HDL (good) cholesterol levels, when part of a diet moderately low in fat, where Omega-3 is the primary source of fatty acids. 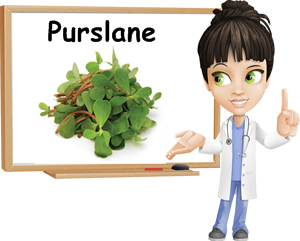 In addition to this, purslane is a good source of potassium (10.5%) and magnesium (17%), two minerals which effectively regulate body fluids, reduce high blood pressure and maintain a healthy cardioac muscle. 4) Supports healthy cell development and exhibits significant antioxidant activity. Purslane contain several potent antioxidants, notably Omega-3 fatty acids, vitamins A and C, as well as copper and manganese. All of these essential nutrients protect cells from oxidative damage caused by reactive oxygen molecules called free radicals. As antioxidants, they hunt down and destroy free radicals, reducing the risk for cell damage and potentially cancer-causing mutations. Other antioxidants found in purslane are carotenoids such as beta-carotene which boast both antioxidant and vitamin A activity. 5) Anticancer properties. In vitro studies point to purslane as a natural antimutagenic capable of repairing DNA damage and inducing programmed cell death in cancer cells. However, further studies need to be conducted in order to officially confirm purslane (or any other food) as a viable cancer treatment. Up to this point, a proper diet, natural and varied, as well as healthy lifestyle habits are viewed as the best methods of preventing cell damage buildup and the activation of certain genes believed to induce mutations in cells. 6) Great for skin health and immunity. Purslane contains generous amounts of both vitamin A and vitamin C. Vitamin A maintains healthy mucous membranes at the level of the nose, mouth, throat, lungs and stomach, the parts of our body directly exposed to viruses and bacteria. Vitamin C increases the aggressiveness of our white blood cells so when our body comes into contact with strong viruses, it is better equipped to deal with them. Both are important immunity-boosting vitamins. Both vitamin A and vitamin C contribute to skin health by regulating the formation of new skin cells, preventing dry skin and encouraging the production of collagen, a protein that helps keep skin firm and wrinkle-free. 7) Anti-aging properties. Purslane owes its anti-aging properties to vitamin C, copper and manganese, potent antioxidants which stimulate collagen production, collagen being the ultimate anti-wrinkle remedy, and prevent premature hair graying as well as iris discoloration. Next time you stumble upon a patch of purslane, will you consider picking it and making a salad out of it?